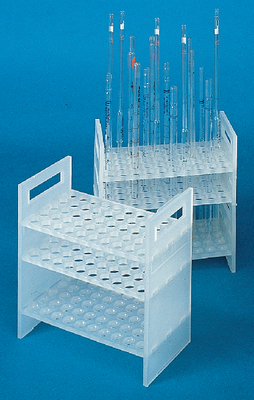 Sturdy molded polypropylene rack holds pipets up to 1/2" in dia in 5 x 10 arrangement. Lower deck keeps pipet tips from surface beneath. Convenient hand grips on both sides. Autoclavable at 121 °C. Size: 8-3/4" H x 8-1/2" W x 4-1/2" D".